The economy turned in another sparkling performance last year, with gross domestic product (GDP) growing at the fastest clip in 11 years and inflation moving below 2 percent. The National Bureau of Statistics (NBS) yesterday announced that GDP grew by 10.7 percent to reach 20.94 trillion yuan ($2.68 trillion). The consumer price index, a key indicator of inflation, inched up by a mild 1.5 percent. 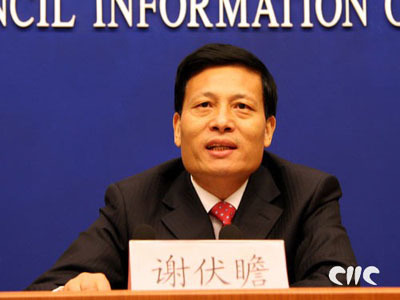 "In 2006, the economy was in good condition," NBS Director Xie Fuzhan told a press conference organized by the State Council Information Office. The economy, which overtook Britain in 2005 to become the world's fourth biggest, is moving closer to that of Germany, which is estimated to have grown by 2.2 percent last year to $2.86 trillion. The World Bank predicts the Chinese economy will grow by 9.6 percent this year; and other mainstream economists put their forecasts at a minimum of 8.8 percent. That means the nation has a good chance to become the third biggest economic power by 2008 but Xie would only say that he believed "the economy will maintain a momentum of rapid, steady growth this year". In 2006, the economy grew on the back of strong growth in investment, exports and consumption. Fixed asset investment expanded by 24 percent, down two percentage points from in 2005. The government made strenuous efforts to tame investment growth last year to avoid overheating. The central bank twice jacked up interest rates and thrice raised the proportion of deposits that banks must hold in reserves. On January 15, it raised the required reserve ratio again. The central government cracked down, too, on investments that were against the country's development guidelines. Xie, who was a senior researcher at the State Council Development Research Centre before joining the NBS in October, said he was worried in 2005 that the economy was heading toward overheating. The cooling-down measures helped avoid that, he said. However, economists believe the authorities will not relax their tightening measures for credit and investment. In particular, a 2.8 percent growth in the consumer price index last month could well trigger a new interest rate hike or a further rise of the reserve ratio for banks, said Frank Gong, chief economist of JP Morgan. This growth occurred in spite of a spate of tightening measures to keep the pace of expansion in check. On the external front, the government may need to be more aggressive in dealing with its swelling trade surplus, said Ben Simpfendrer of the Royal Bank of Scotland. China's exports grew 27.2 percent in 2006 while imports expanded by 20 percent, resulting in a surplus of $177.5 billion, compared to $100 billion the previous year. The surging trade surplus has increased friction with trading partners. The country's hefty foreign exchange reserves, which can largely be attributed to the huge trade surplus, have also contributed to rapid investment growth by adding to the money available for lending by banks. "It is not in China's interests to have such a large trade surplus," said David Dollar, the World Bank's country director for China. China's top policy makers have said curbing the trade surplus will be a focal point for the country's economic endeavors this year. Stimulating domestic consumption will be another theme, as it has been in recent years. Growth of retail sales, a key indicator for consumption, accelerated by 13.7 percent last year as compared to 12.9 percent in 2005. But the rate still lagged behind investment growth by a big margin. Economists generally agree that the country needs to improve education, heathcare and social security systems to reduce the money that citizens have to put aside for these purposes. But that cannot be achieved overnight, Xie said. Dollar said China could collect dividends from profitable State enterprises and use the money to improve education and health systems which would reduce investment growth and increase consumption. Overall, the prospects for the Chinese economy this year are favorable, Dollar said. "There is no big danger for the Chinese economy in 2007," he said.